Living on bread and water: For Sher. Sher , of What Did You Eat is no longer with us. And it shocked us all. Although I never met her in person , never even saw a picture of her (until recently at Glenna"s tribute , look at A Fridge Full Of Food ) I'm mourning. 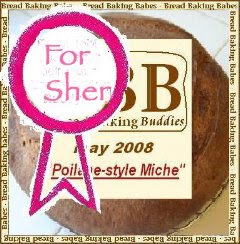 She was our Bread Baking Babe - sister and we had fun with her. It must be so hard for the family and close friends to lose her. I whish them all the strenght they need . At BBB's we want to bring her a tribute , coming from all over the world as we are. I've choosen her couscousrecipe : Couscous With Spinache and Lemon Chive dressing. Because we're very fond of couscous here , but more because her hillarious story about her not beiing able to sleep and running around with a paintballgun. That's Sher for me.I loved her for that sence of humour. Read it for yourselfs , you'll find it at "pasta's " . And no, I'm not posting the recipe here. Go , look , and find it at Sher's blog , What Did You Eat , that's so much worth visiting , even if she 's not there anymore. Her blog is a tribute to herselve. After I finissed making her lovely couscous dish , I figured out my camera wasn't home. It went to Greece , with my daughter....So , sorry, no pictures. Well, it didn't taste anyway, although the family here LOVED it . For me, on that moment there was one ingrediënt to much in it , to make it taste : SADNESS ! Thank you for letting me know you and beiing Babes together , Sher . There will be an empty chair forever in that backrow of our BBB-classroom ! What a lovely tribute to our sister. I can't stand the idea that every time I stand up in the front row and look back at you guys there is an empty seat. Lovely, Monique. Please pass me a tissue. What a lovely tribute to Sher. She was such a great person. Wonderful tribute, Monique. You did great. That's a wonderful recipe and Sher used to eat a lot of couscous. Yummy stuff. Thank you! Yes, I loved how Sher could make us all laugh. She is missed.